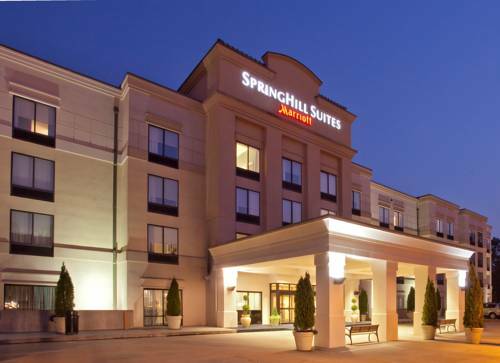 Newly redesigned in the historic Hudson Valley minutes from Manhattan, SpringHill Suites Tarrytown is an long term stay hotel that offers style and space at a moderate price. This all-studio suite Tarrytown hotel is designed to fit your lifestyle with suites that are 25% larger than average hotel rooms and including areas for working, dining & sleeping. Enjoy luxurious bedding, ergonomic work desk & functional granite countertop area with mini-fridge, microwave, coffee maker & bar sink. Our free shuttle provides transportation to local companies including Siemens, IBM, Carl Zeiss, PepsiCo, Bayer, Westcon & Schott. Also nearby are Pace and Fordham Universities, Phelps Memorial and Blythedale Children's Hospital, Westchester Medical Center. Spend free time at historic attractions including Lyndhurst, KyKuit, Philipsburg Manor and Sunnyside Estates. Guests enjoy our new breakfast buffet. Favorite beverages & pub-style light fare are offered in the Lobby Bar. Museum with artifacts from the notorious New York prison. Which is right down the street. Remnants of the US Space Program and the 1964-65 New York World's Fair.